Successfully Added Luxury Quadband Dual Sim Touchscreen Phone (Black with Chrome) to your Shopping Cart. Luxury Quadband Dual Sim Touchscreen Phone (Black with Chrome). This slim profile quadband GSM unlocked dual SIM cellphone has a spacious 3.0 inch touchscreen and is ready for worldwide use. A stunning quadband phone coming in a flattering slimline form factor, this model is presented in raven black with a chrome finish to frame its luxurious curves. Fully unlocked, this dual SIM phone offers native quadband functionality (850MHz, 900MHz, 1800MHz, 1900MHz) to work on any GSM network of your choice. Coming with two SIM card slots, you can be confident in never missing a business or personal call with two active phone numbers stored inside one individual mobile phone (dual SIM with dual standby). Packed with plenty of easy-to-use productivity tools and multimedia features, this modern-day electronic companion is designed to keep up with your busy lifestyle, maximize your productivity and lets you take your entertainment wherever you go. Use it at work, use it at home, use it anywhere in between. Enhance your personal and your business life with the M26. Among the many features available in this modern mobile phone includes a robust phonebook and contact manager for those who want to stay on top of their busy lifestyle, an easy to use intuitive touchscreen keypad to give you easy access to all onboard media and communication features, plus Bluetooth for excellent wireless connectivity. The perfect combination of sophistication, functionality and practicality, this touchscreen phone would be the ideal choice for today's busy, style-conscious user. Turn heads wherever you go with this stunning device. 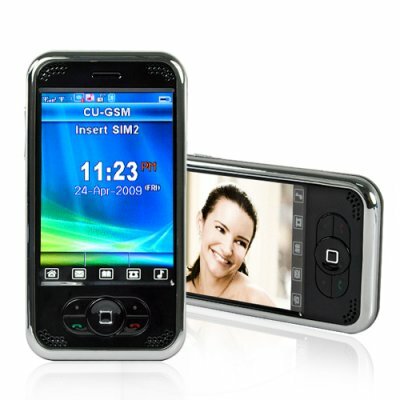 This phone has something for everyone and would also make an ideal gift with its broad appeal and attractive design. The CVSC-M26 is proudly brought to you by Chinavasion Electronics. Order your stock now and don't forget to look at our Bluetooth adapter section of the website for earpieces and other accessories you can utilize while you are making calls while on the road. User-friendly touchscreen user interface and impressive multimedia feature set. really is very good phone !